Several Whales Dead, Dozens Stranded Off Florida Everglades : The Two-Way The mass stranding has occurred in a remote area of Florida's Everglades that's only accessible by boat or helicopter. Wildlife officials are working to redirect them back out to deep water. Dozens of pilot whales are stranded in shallow water in a remote area of Florida's Everglades National Park. At least 10 pilot whales are dead and dozens stranded in the shallows off Florida's southwest coast, as wildlife workers struggle to redirect them back out to deep water. Blair Mase, the marine mammal stranding network coordinator for the National Oceanic and Atmospheric Administration, says four of the whales had to be euthanized on Wednesday, and six others had already died since the stranding was first identified on Tuesday. NPR's Greg Allen, reporting from Miami, says the mass stranding has occurred in a remote area of Florida's Everglades that's only accessible by boat or helicopter. 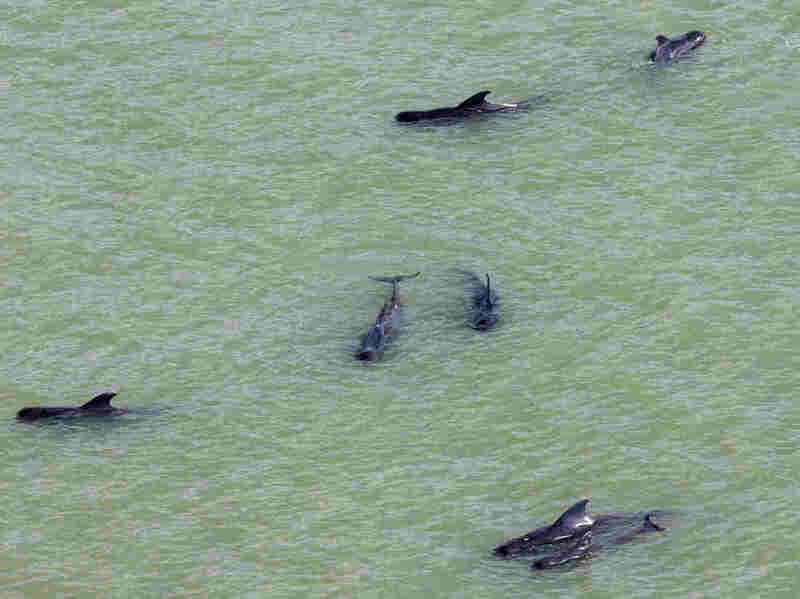 "Cameras on some of those helicopters show dozens of short-finned pilot whales swimming in water just a few feet deep. The whales, which are 12- to 18-feet long, were refusing to stray far from whales that have already beached and died," Allen says. Linda Friar of Everglades National Park says rangers were first alerted to the pod by a fishing guide Tuesday afternoon in a part of Florida Bay that has long stretches of shallows. "So when the tide goes down, you can have 6 inches to a foot of water for multiple football fields. It's just really far. That's part of the challenge in getting these whales enough water so they can get back out to sea," Friar says. Mase says those on site Wednesday, including federal and state wildlife agencies as well as volunteers from two private marine mammal rescue groups, are monitoring the health of the whales, and considering ways to lead them to deeper water. At this point, Mase says, there are no good options. "Deeper water is miles and miles away. And these whales seem to be determined to be sticking near by the dead, stranded ones," she says.